One grey, very rainy November day we sat for hours in a cafe in Berlin near the Hackesche Höfe jotting down various ideas and laughing too. We talked a lot about what we both were missing the most …the reason we actually had both started this adventure: The trying out new things…the eagerness to learn new things …to fail…to not care and still show it….the time to spent doing fun things…out of the box things…sometimes even normal boring things…. 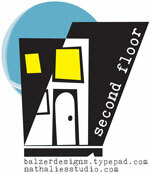 Julie & I have made a one-year commitment to each other and our “Second Floor” project. Every few weeks we will issue a challenge (just something to spark some creativity – sometimes starting without a prompt can be very intimidating). Your assignment is to take that challenge and make some art. Here’s the most important part: at some point you need to “take it to the second floor.” What does that mean? It means trying something vastly out of your comfort zone. Doing something that might not work. Experimenting with a crazy idea. It’s all about pushing yourself. If it works, awesome. If it doesn’t work, awesome! If you want to participate publicly, we’ll have a linky list for each challenge . If you don’t want to participate publicly, that’s cool too. It takes a lot of courage to put yourself – not necessarily at your best – out there. We have a private flickr group set up for those of you who want to share sort of publicly but within the safe confines of a private group. If you want to join the group, you will need to e-mail to secondfloorchallenge(at)googlemail(dot)com we’ll send you an invitation. Nat I need to say thank you to you and Julie, whose work I follow some time just by myself.Fisrt of all tks for sharing your feelings, that make me feel just one more in zilion people, which was very important to me. I am an artcrafter for hobby, that make me free to think outside the box, and I´ve been failing for some time, so so the fear of fail is not that big to me, but it´s still something that make my criativity stuck. So thank you very much and I´ll try the second floor. PS. I am sharing the same text in both blogs cause it´s so so true.